On October 1, 1918, the Weinstein family of Elmira was notified that their son, Jacob, was sick at the Great Lakes Naval Training Station near Chicago. Spanish Flu had reached epidemic proportions at the base, and one Elmira man had already died there. Jacob, a Pharmacists Mate, had been tending the sick when he fell ill. His brother David boarded the first available train to Chicago. By the time he arrived at 4pm Chicago time, Jacob was already dead. The Spanish Flu epidemic was the second deadliest epidemic in the history. There are no definite numbers due to poor record keeping, but somewhere between 20 and 100 million people died of it worldwide. Nationwide, over a quarter of the population was infected while approximately 600,000 dead. While most flus only kill the very young, the very old, and the sickly, the Spanish Flu’s main victims were healthy young adults. Young people in the armed services dropped like flies. During World War I, approximately 5,000 Chemung County residents joined the armed services. 138 of them never came home alive. Of those, nearly 2 dozen died of the flu or related complications. In many ways, the war created the perfect storm for the epidemic. Soldiers traveling across the country in crowded troop trains infected each other and people in the towns they passed. Here in Elmira, the local chapter of the Red Cross had a canteen at the railroad station to provide refreshments to men on the troop trains. During 1918, they served 126,798 troops. 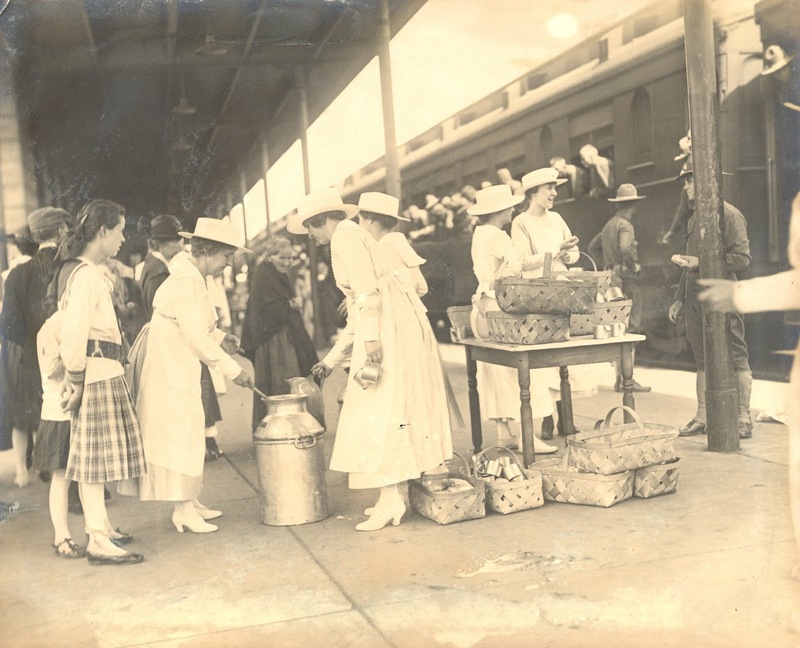 In late October, Red Cross canteen workers discovered 12 Oklahoma men sick with a flu on a passing troop train. The men were removed to Arnot-Ogden Hospital where they all eventually recovered. Who knows how many men they had already infected by then? Conditions at the training camps were terrible as men from all over the country infected each other. The camps were very crowded with as many as 25,000 to 55,000 men. The flu first struck in Boston in late August and, within ten days, thousands of recruits at the nearby Camp Devens were sick. Seemingly healthy soldiers were transferred out to other camps, spreading the disease with them. Rates of infection at the camps varied wildly from just 10% at Camp Lewis, Washington, to 63% at Camp Beauregard, Louisiana. The average were somewhere between 25 to 40%, with approximately 2% of the infected dying. Camp Wadsworth, South Carolina, where Elmira's Company L trained. Training camps were woefully unprepared to deal with the epidemic. Not only were individual camps slow to initiate quarantines which might have prevented the spread of the illness outside the camps, they failed to institute internal quarantines as well. Men were turned away from sick call unless they were running a fever of over 101 degrees and the military’s insistence that training continue meant that those who did not yet qualify for sick call could infect their classmates and instructors. Camp medical personnel often lacked necessary supplies to treat the sick. At the Great Lakes Naval Training Station, only 96 out of 674 hospital workers were issued masks. Over 25 nurses and hospital corpsmen, including Jacob Weinstein, died as a result. Check out Spanish Flu to see the effects of the flu on Chemung County. 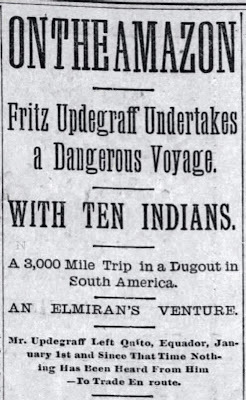 On November 18, 1894, Fritz Up De Graff of Elmira sailed from New York City on the SS Advance bound for Ecuador. The young man had recently graduated from Union College in Schenectady, New York with an engineering degree. While a student, he met Domingo Cordovez, the son of a wealthy Ecuadoran. The pair became fast friends and spoke about going into business together to bring much-needed modern improvements to the City of Quito. Fritz had always had an adventurous spirit – he was an original member of Rufus Stanley’s Rambling Club – so, with $100 in his pocket, Fritz left his home in search of adventure and profit in South America. For two years, Fritz lived as a guest and then employee of Domingo’s father. The Cordovez family occupied a position of importance in Ecuador. They owned eight hundred squire miles of forest in which they operated large cattle and horse ranches and multiple plantations. Fritz described those years as one long series of commercial disappointments. He got involved with one get-rich-quick proposition after another with the family. They were going to start a furniture factory, clear 50 acres of forest and plant coffee, build roads, bring electric lights to Quito, build a tannery, bore for oil, distill whiskey, and a whole host of other business ventures. Fritz didn’t lose any of his own money in these schemes (most of the $100 he left home with was spent on his trip south), but he did not make any money either. In January 1897, after a falling-out with the Cordovez family regarding their treatment of workers, Fritz decided he was ready to move on. Instead of shipping back to the United States, he chose to do some exploring. He sent a letter home to his mother and sisters telling them that he and ten natives were striking out for the Napo River, one of the western tributaries of the Amazon River. They would take a dugout canoe some 3,000 miles through some of the wildest parts of South America. He expected they would arrive in Para, Brazil by March or April where he could take a steamer back to New York City. 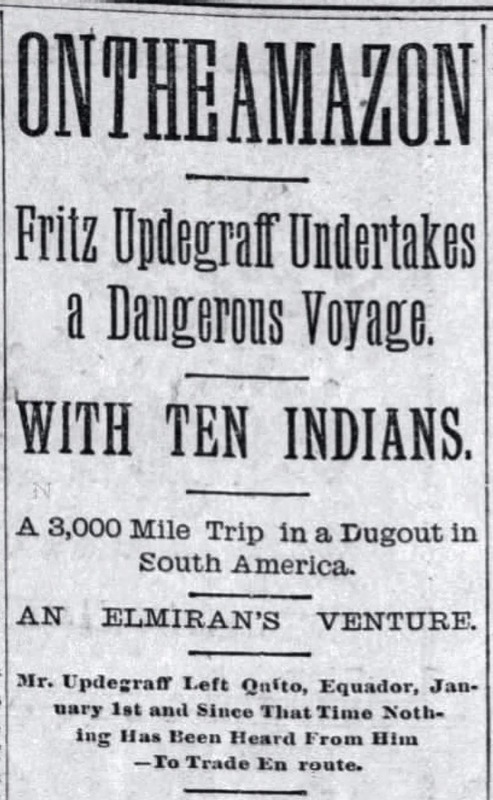 The Star-Gazette in July 1897 called Fritz’s expedition into the Amazon “the most exciting and novel trip ever attempted by any Elmiran” and declared that “never was a similar trip with more hazardous undertakings attempted by any white man of his age.” These glowing words came in the same article that described how his family had not heard from him in nearly eight months and how they had been writing letters to the US consul in Para with the fears that he was dead. In some ways, it is surprising that Fritz actually survived his ordeals. The saying, “if it wasn’t for bad luck, he’d have no luck at all,” certainly applied. His native guides abandoned him within days of heading into the jungle. Fortunately, he did not find himself entirely alone. He met up with another American named Jack Rouse and they traveled together for four years. The pair suffered terribly through that time. They were attacked by vampire bats and mosquitoes, had their canoe destroyed by a panicked tapir, lost their belongings to unscrupulous outpost managers, nearly starved to death on several occasions, were repeatedly abandoned by their hired help, and suffered various severe fevers and illnesses. On the positive side of their adventures, they profited from the rubber trade, ate new, exotic things like monkeys and anteaters, killed at least one man without consequences, and rescued a young native woman who had been captured by a rival tribe (though she seemed to help them almost more than they helped her). The pair also successfully lived with several tribes of the Jivaro people, or Shuar as they call themselves, who were known for their practice of shrinking human heads. Fritz and Jack parted ways in April 1900 after many adventures. Jack was ready to leave South America but Fritz was not yet prepared to return home. He got involved in a couple more money-making schemes – one in the rubber trade and one involving cattle and cedar. Finally, he had had enough travel and boarded a steamship back to the United State. On November 18, 1901, he arrived back in New York City; exactly seven years to the day that he had left. In 1921, after years of telling his stories to family, friends, and other enthralled audiences, Fritz wrote Head Hunters of the Amazon. The book was first published in November 1922 by Duffield & Co. in the United Kingdom and then in February 1923 in the United States. Eventually it was translated into 13 languages. The book, with a forward written by Kermit Roosevelt, was wildly popular with readers and critics. A reviewer at the New York Times wrote: “The dominant note of Mr. Updegraff’s volume, and at the same time its potent charm, is its personal, straightforward manner of presentation.… His is the easy intimate style of a fluent narrator; his is the art of transforming his thoughts into written words with a sure freedom from hesitancy or affectation.” It is still available in print from several online booksellers and is truly an enthralling read. After his time in the Amazon, Fritz continued to travel. He met his wife, Eleanor Grosvenor, on one of his many cross-country trips as an electrical and construction engineer. They married in 1904 and had three sons. They lived in many different place around the world including the U.S., England, Canada, Spain, and Cuba. They were living in Mexico in 1910 when revolution led by democratic reformer Francisco I. Madero broke out against dictatorship of Porfirio Diaz. 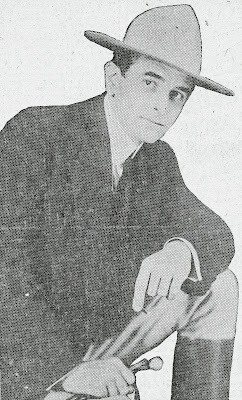 On December 24, 1927, Fritz died of injuries he had sustained in an automobile accident in Baton Rouge, Louisiana. On April 12, 1933, New Jersey mobster Waxey Gordon, aka Irving Wexel, received troubling phone call at his office in Elizabeth, New Jersey and left. 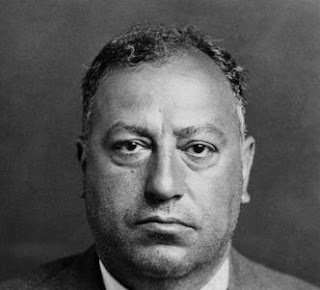 Minutes later, a business rival murdered his two lieutenants, Max Hassell and Max Greenburg, who were waiting in his office for his return. The investigation into their murders kicked off the biggest Prohibition bust in New York State and shown a spotlight onto the corruption which ran deep in Elmira. 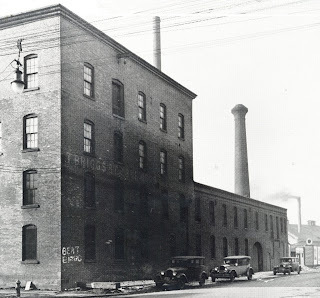 In 1932, Gordon, operating under the alias “George Pierson,” purchased the old Briggs Brewery in Elmira on the corner of State and Second Street from Frank Teitelbaum. Founded in 1868 by brew master Thomas Briggs and his financial backer John Arnot, Jr., T. Briggs & Co. was owned by the Rathbone Corporation at the start of Prohibition in 1920. Although officially closed for business, it was raided several times for illegal production of alcohol from 1925 to 1931. See The Cereal Beverage and “High-Powered Beer” Scandal for details of a raid in 1927. Those other raids would be nothing compared to what was coming. During the course of their murder investigation, New Jersey police uncovered a safe full of documents relating to Gordon’s operation in Elmira. On April 22, 1933, federal agents from Bureau of Prohibition raided the Briggs Brewery. They discovered that the brewery was connected to several adjacent buildings by a series of rubber pipelines which ran through the sewers. One line ran mash from the Rice Storage Warehouse on Canal Street to the distillery at Briggs. A second line ran the finished product back to the warehouse. A third line ran fuel oil. Divers from the New York City Police Department were brought in to help search the sewers for additional evidence. They discovered a stone chamber under the Acme Products Company, located in the old Lehigh Valley Railroad Station at the corner of 5th and Baldwin which was being used as some sort of workroom too. There was also a dedicated railroad spur from the station which the bootleggers were using to transport the alcohol down to New York City. A review of Gordon’s books showed just how profitable the Elmira operation was, or rather wasn’t. They produced 5,000 gallons of alcohol a day. Between October 1932 and March 1933, they sold 124,935 gallons of black market booze. It should have been insanely profitable, and yet, Gordon was $55,860.50 in the hole. Why? Graft. He paid approximately $6,700 a month in protection money to keep law enforcement off his back. The Elmira police were almost certainly on the take. They detained federal officer Raymond Keith when he attempted to investigate a delivery of molasses on December 8, 1932. In another instance, an Elmira Police flashed its lights into the brewery office just before a raid was set to occur. On August 15th, federal agents complied a report for the U.S. District Attorney in Buffalo with evidence against 37 individuals and 5 corporations. Seven of those 37 individuals were Elmirans. Of those, three were well-known Elmira businessmen. They were able to arrange a plea deal which kept their names out of the papers. in the end, no one served any jail time related to the final Briggs Brewery raid.